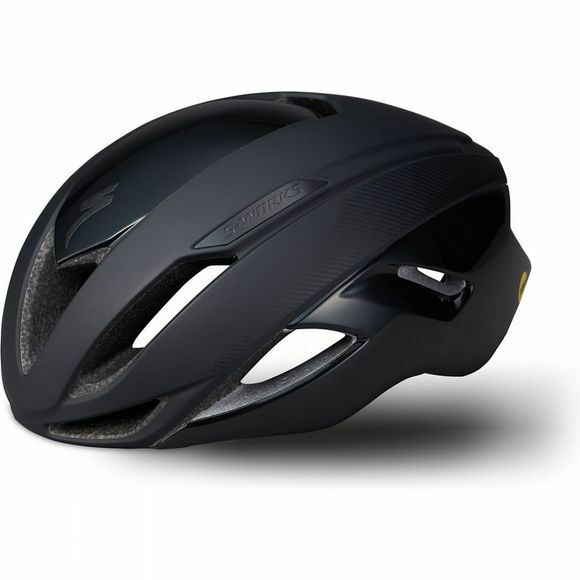 The light-weight, well-ventilated and aerodynamic S-Works Evade MIPS Helmet with ANGI from Specialized is one of the fastest road helmet out there. Thanks to havinging their own wind tunnel, Specialized has developed this poduct with aero at the forefront of the design, carefully analysing every aspect of the helmet's performance in the 'Win Tunnel' and with real world testing. Ventilation and aerodynamics were both optimized in the Win Tunnel together to get the best combination. Exterior vents and interior channels have been carefully considered to make sure that the helmet draws in the maximum amount of air through the helmet for extreme cooling. The helmet's designers also took grams out of the drag without sacrificing safety while also switching the the construction to favour Specialized Energy Optimized Multi-Density EPS that optimizes the foam type in different places. The new ANGi Crash Sensor gives you and your loved ones peace of mind like never before. When combined with Specialized's iOS or Android app, the sensor will detect a crash and send a text message to specified contacts in your phone. It also syncs with the app and Srava to provide GPS-based activity tracking.